I had a nearly perfect birthday. 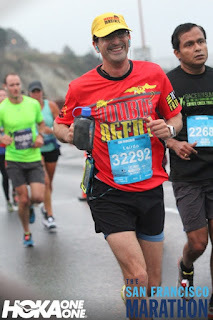 While the calendar shows about four weeks elapsed since my last marathon and your tremendous support of my charities and my running, those good feelings continue. The momentum of my birthday run carried through the entire week that followed both professionally (closing an acquisition) and personally (my sister delivering a healthy amazing baby girl). When I last posted, we were sitting at just over $23,000 in donations. I wistfully wondered if we could possibly push over $24,000. When doubled, this would equate to $48,000 - One cool grand for each of my forty-eight solar cycles. Instead, you came through with big and small gifts to take us clear past $26K! That’s a thousand per marathon mile! And doubled is an ultra marathon amount of $52,000! Thank you all so very much! One reason I like running races is that this effect is amplified. The group self selects - one does not attempt a race if not actually interested in running. Of course, it might happen, but rarely, especially at longer distances. When staying at the Waitsfiled Inn, the host hotel for the Mad Marathon, the breakfast room was populated almost entirely by fellow runners. So, comparison conversations popped up immediately - what’s your favorite or best time or next race? And sometimes the topics stray to a deeper enquiry - why did you start running? Why do you keep running? The answers vary and sometimes are surprising. I met a professor from Iowa who, besides completing the 50 state marathon quest with his wife (Vermont was 38 for them both), he was also completing at least 100 kilometers of cycling in all 50 states too. There is a whole community of people who do this and host each other on official routes in all of the states. After Vermont, he was hitting New Hampshire and Maine in the following days. At a different spectrum, I have recently been pinged by someone who started running in his 60’s to raise money for research into a disease ailing his brother. Now about to turn 80, Bob will be celebrating by competing in his first triathlon. When I ran the San Francisco half marathon a few weeks ago, I met a couple from Brazil. Andre and Marina wore identical outfits other than their shoes, and I asked them about this fashion choice. Recently engaged, the couple were traveling the coast of California and attending two different weddings of friends. 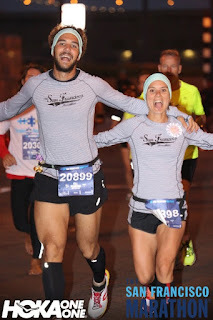 They asked me if I knew a good late march marathon as they had just become engaged themselves and wanted to run one together on their honeymoon following their March 19 nuptials. In the same race, I ran 3 miles with Liz. Liz was doing the full marathon, so we said goodbye at mile 12 as the course split between the half finish and the full continuation. 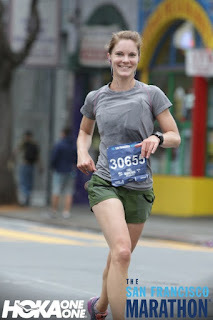 Liz was actually one of those accidental marathoners. She signed up only after her neighbor told her about the race. Originally from Washington but now living in SF, she decided to try it for the challenge. Her friend became injured and did not compete, but Liz continued. 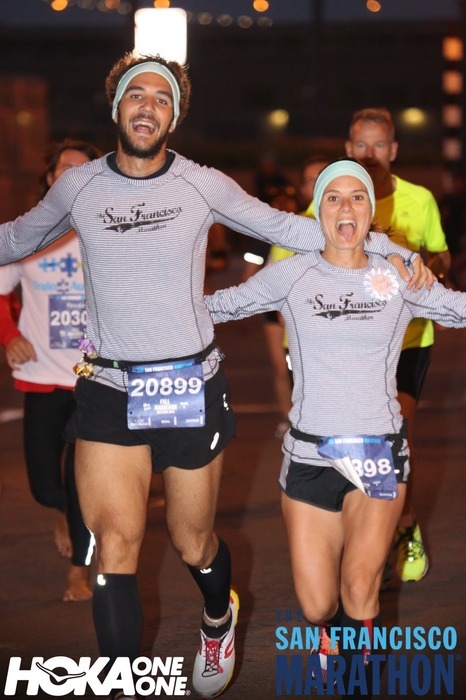 She planned to do more marathons if she enjoyed the experience. Her speedy 3:33 finishing time - even for her young 29 years - certainly suggests her impressive first finish is nor her last. 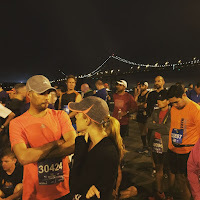 My co-workers Raul and Kit also ran in races at SF - Raul did the full marathon and Kit finished his first 5K. While we did not get to meet during the runs, we texted back and forth before and after. Knowing we were out there cheering for each other gave a further sense of community, and a series of high fives the next day in the office. Raul nears the finish. Love that shirt! Meanwhile, I continue to run. 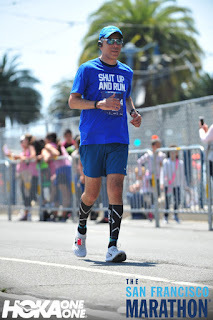 I have 7 marathons planned over 4 months. I have at least two half marathons too. 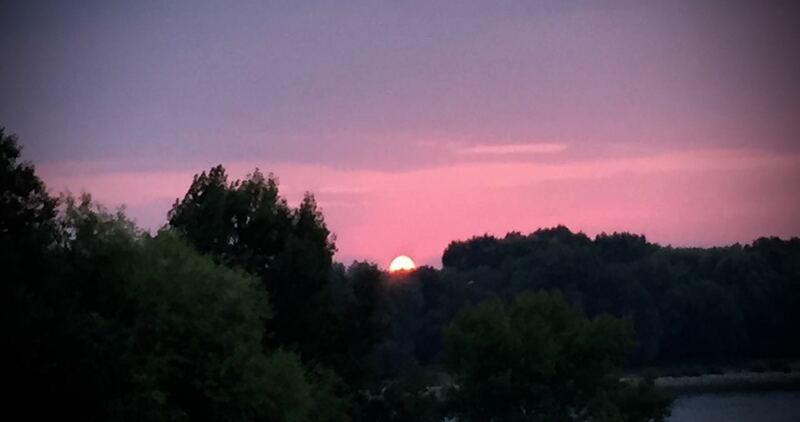 I am posting this from Germany where I am working this week, and have already logged 28 miles near the Rhine river. Today I did 13 and hope to run 20 on Sunday in London. Each run is special and rewarding. I wave at the fellow joggers and cyclists. Most wave back or nod. My last thought as I close out this sequence of posts is to address the shy way people tell me they exercise. For some reason, people feel compelled to apologize for "only" running 1 mile or 3 or 5. I always encourage any amount of running or walking or just getting off the couch. Whatever you do to be active - enjoy it. Do it. Reward yourself. Whether you mow the lawn, do the laundry or run a marathon - or all three - that’s great. We can inspire each other with our passions and our accomplishments. For now, another day, another run. Perfect.